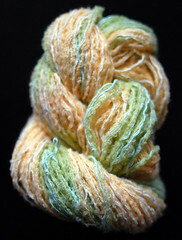 new recycled kit yarns in the shop! 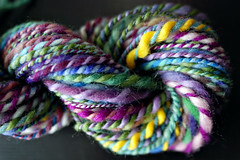 new yarns in the shop!! 7 new kits total. the 4 pictured on the ends are all for spiraling stripes hat kits, and the 2 in the centers are for ninja mitts kits, but of course they can all be purchased alone if that’s what you want. 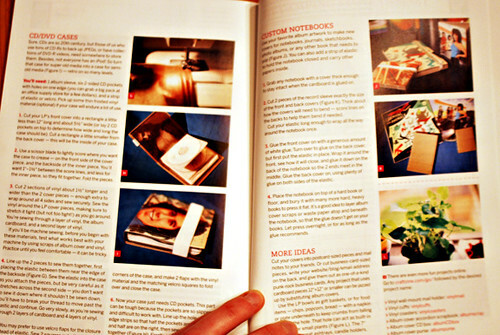 and of course all the pattern pdfs can be bought alone also. 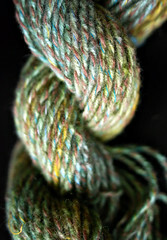 the 3 top yarns are of my new “spun recycled” variety, which means they are multiple recycled yarns spun and plied together. 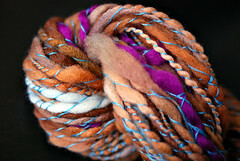 they all include some part angora (details are in the shop descriptions). 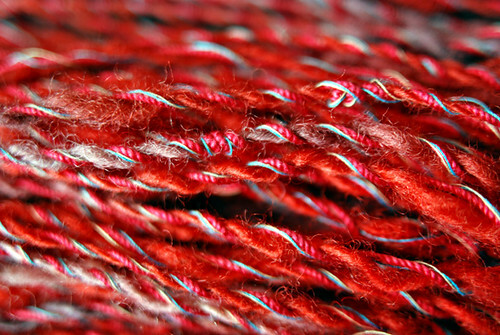 i am really in love with these yarns – it’s so hard to put them for sale, but i have so much yarn already, i can’t rationalize keeping yarns that are meant for the shop. 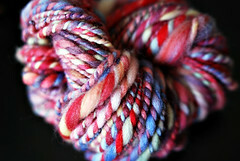 but maybe a few of them, if they don’t sell within a few weeks, hmm…… yumyumyum yarn…..
spun recycled and more spinning! i was planning to have a bunch of new knit kits in the shop today, i have the yarns all dyed and pictures taken, but i have been weirdly unmotivated today, blah. part of it is because i’m having issues with my arm hurting, for about two weeks now, and it’s really starting to piss me off. grr. and then i think this motivation problem has to do with having so many plans and projects jumping around in my head and wanting to finish/start all of them and not being able to focus on any one productive thing. or something. 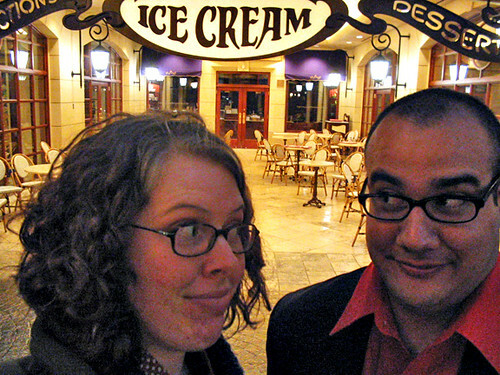 so i end up spinning and clicking around blogs and stuff for hours and not updating my site like i should. tomorrow! for reals! 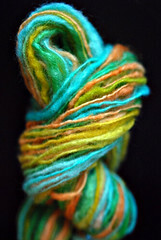 so what i’ve been playing with lately is spinning different recycled yarns together, or yarn(s) with thread(s). 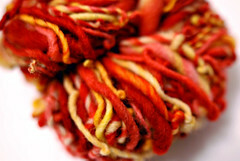 i added this new line of yarns to ravelry, and will be adding at least one as a mitt kit yarn (the red one below) for sale tomorrow, and more later this week. 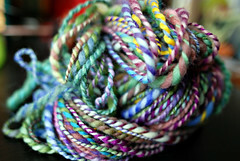 i stocked up on tons of threads at my favorite craft thrift store, so the yarns are spun with all recycled materials, woo! 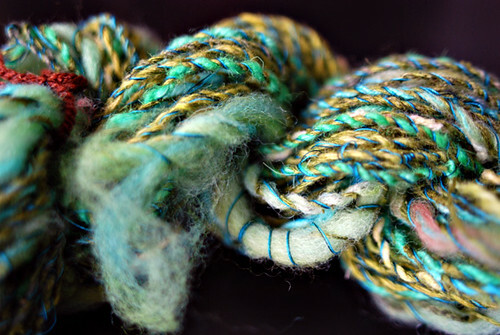 that top one is a mini-skein spun for myself as an experiment – a bunch of recycled scraps that i threw in the dyepot with other yarns, then spun with chunks of roving holding them together, then plied the whole thing with three different threads to hold it all securely. 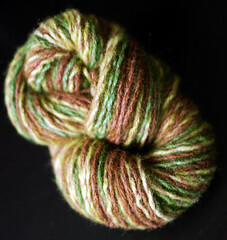 worked out pretty well, but it took a long time, so i don’t know if that whole method would be worth it for kit yarns. and also, i got new glasses today!! my brother matt’s birthday present to me – flight of the conchords dvd – which we watched late into the night last night. so so SO funny! highly recommended!! sleeping in and pete bringing me stumptown coffee in bed, such a nice way to start the day. lots of supersweet birthday comments/emails from family and friends, and happy fun feedback about the rap, yay! thanks everyone!! 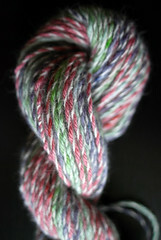 spinning a prettytastic skein of yarn, practicing my plying, looking good. and pete gave me two spinning books! 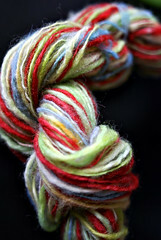 a great instructional one, and the beautiful pluckyfluff handspun revolution! 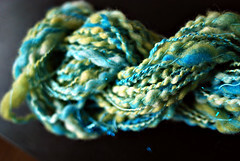 then knitting up the airplane through valentine clouds yarn i won from insubordknit into a great, fat+fluffy neckwarmer. love it!! and now i have to tell you how hat attack went for me, it was so much fun! so, in this killer hat swap, you get assigned a target, who could live anywhere in the world, to try to “kill” by getting your hat to her/him as quickly as possible, before you receive a hat from your assassin. well, by complete coincidence, my target, kate, lives in my apartment complex, right across the yard! unbelievable right? so it was extra fun for us! 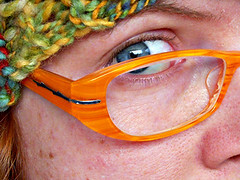 i finished knitting the hat at work yesterday, got home around 5:30, then i wanted to wait to attack until pete got home so he could photograph the event. 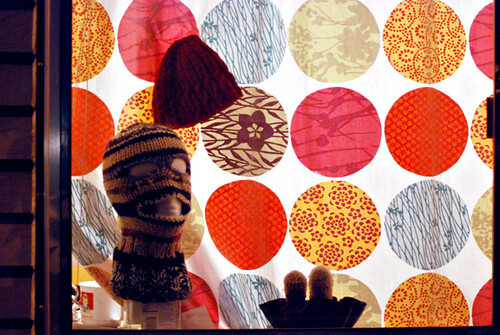 so, i let her know of her impending death by putting my scary mask with the hat in the window, looking at her window. and i killed her! mwa ha ha ha!! fun times! i’m so glad i did hat attack! 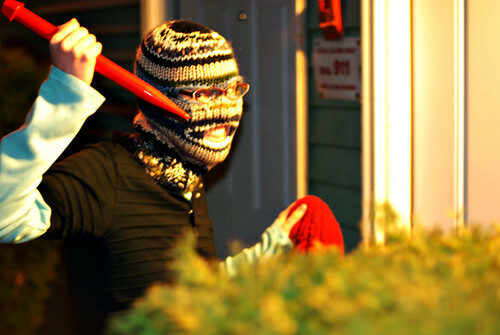 if i hadn’t been assigned kate as my target, i probably never would have even known i lived across from a cool knitter! 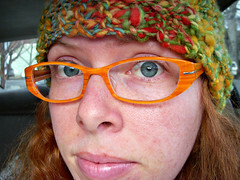 now i’m just waiting for my hat of doom to arrive in the mail and kill me… i hope it’s a good color! it’s here! 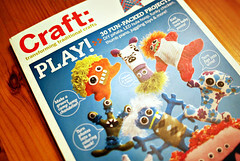 Craft:06 on shelves at last! it is an awesome issue, and i still can hardly believe i’m a part of it! 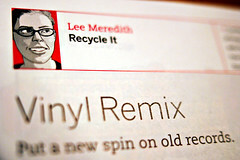 that’s right, way back there at the end, you’ll find the “recycle it” column is written by me! woo! i can’t stop using these exclamation points! yeah! my column will show you how to make a bunch of rockin things from records and album covers (and i tried to throw a bunch of puns in there, yeah!) – including bowls, cd/dvd cases, letter sorters, clocks, and notebooks. fun stuff! 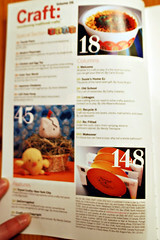 and i was so excited to see that they even put one of my photos on the table of contents page! ok i’m exhausted and can’t really think clearly enough to write anymore. i just wanted to get this posted for the release date. i’m having a great time down here with my family – got to spend time with all three of my rad brothers, saw the diving bell and the butterfly with my mom (loved it! ), helped my brother matt move from san diego to santa monica, spent quality time with the supersweet kitties and spud, hardly touched a computer for the last week (kind of refreshing, you know)… definitely glad i came. i’ll be back in portland tomorrow night, catching up with blogs and getting back to dying yarn for more kits later this week. for now, sleep!